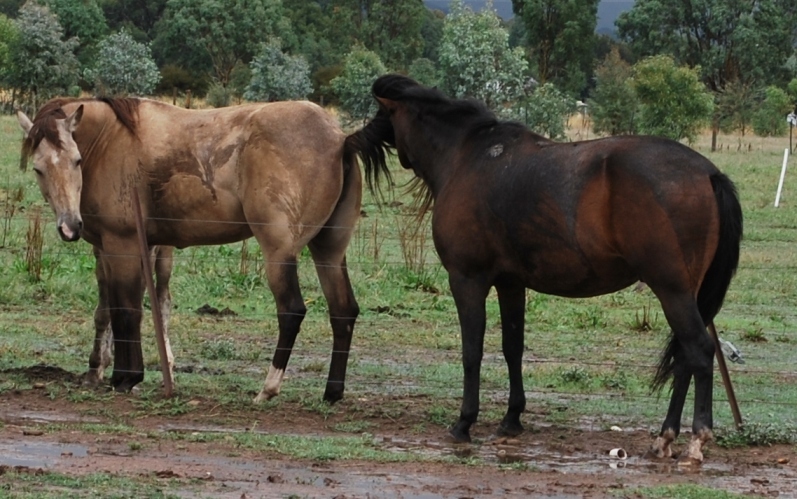 Perhaps you have broodmares of your own or you plan to have some in the future. Perhaps your desire is to work with them or increase your working knowledge of them. Either way, being familiar with the reproductive physiology of a broodmare is a great thing to do. Knowing how things best work in a horse’s system allow us to better keep them in the condition they should be. It also means we can determine the best time to breed a mare and have her conceive. Fillies start cycling from around 18 months of age. Horses don’t reach maturity until around 5 years of age, however. It is for this reason that many hold off on breeding. It is not uncommon however for a 3-year-old filly to be bred and for her to have a foal by the time she is 4 years of age. Whatever the age or the breed of the mare, she should typically behave in a particular way when it comes to her reproductive cycle. 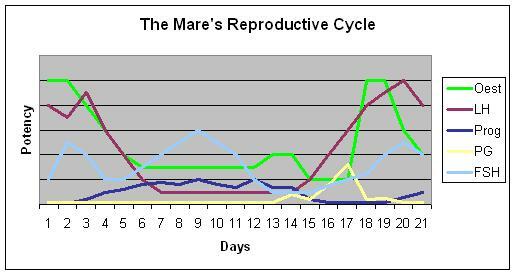 A mare’s cycle lasts 21 days on average. Over this time, there is a period where she comes into heat – is receptive to a stallion. This is known as being in season or in oestrus (estrus). This period lasts for up to 7 days, but typically 3 – 5 days. For the rest of her cycle, she is not in heat – she is no longer receptive to a stallion. This is also known as being out of season or in dioestrus (diestrus). The mare’s cycle is able to be followed fairly consistently because of hormones at work in her body. If we consider at the start of the 21 days that the mare is in season, then she will have high levels of oestrogen, which causes her to show signs of being receptive. There is also a luteinising hormone in high levels; this causes follicles (fluid filled sacs with eggs in them) to mature and then rupture, releasing an egg (ovulation). Once the egg has been released, the burst structure develops into a corpus luteum (CL). After the mare has ovulated, her interest in stallions drops fairly quickly. She goes into dioestrus and the hormone progesterone is being produced by the CL. This is what results in her lack of interest in a stallion. 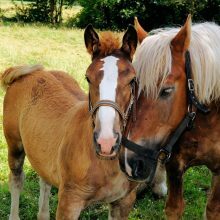 It is also the hormone that is high when a mare is pregnant. If a mare has ovulated without being bred or she has been bred but she doesn’t fall pregnant, then two weeks later her uterus will produce a hormone known as prostaglandin. This hormone breaks down the structure that was created after the mare ovulated – the corpus luteum. This means that progesterone levels drop. A hormone known as follicle stimulating hormone (FSH) then acts on the ovaries, causing them to produce more follicles. Some of these follicles grow and one or two mature, producing oestrogen. The mare starts to show signs of being receptive to a stallion again and her cycle is repeated until she is bred and goes into foal. If this occurs, then she will no longer show signs of being receptive to a stallion whilst she carries a foal. Understanding what happens in the mare’s cycle means that it is easier to determine when she should be bred to a stallion; it is also easier to ascertain when she will fall pregnant. As a manager or owner, this makes the breeding process more efficient and less costly. Knowing what is happening in the mare’s cycle and being able to match this with her behaviour towards a stallion can also make things less costly. A lot of reproductive work is now based on ultrasounds. These are carried out by a licensed veterinarian. The process can be quite costly if a mare is to be bred purely on when the vet says she is ready. For those who are familiar with the world of breeding, they may know that sometimes mares are ‘short cycled’. This means that when she is in the dioestrus phase and the corpus luteum is active, she is given an injection of prostaglandin. This effectively shortens the mare’s cycle, bringing her into season quicker. Consequently, she can be bred sooner than waiting for her to come into season naturally. If you know what is typical in a mare’s reproductive cycle, you can also identify what is atypical. Some mares are not right physiologically speaking, for breeding. If a mare is purchased with the intention to breed, it is in your best interests as an owner to know if this is physically going to be impossible. Whether it’s a conformational issue that stops a mare getting pregnant, a chromosomal issue that stops her ovulating or something else – knowing what looks normal helps. A working knowledge of the mare’s reproductive physiology allows stud managers and veterinarians to prepare the mare at the best possible time – and often in the quickest possible timeframe – to breed. There is definitely a science behind breeding horses these days, whether for performance, pleasure or financial gain. Knowing what is considered normal for the broodmare is knowledge that is worth gaining and acting upon.